Abbott Laboratories (ABT) is due to report earnings this Wednesday and it is on Jim Cramer's buy list. It was mentioned on Mad Money Friday night, but I like to look at the charts and indicators instead of drilling down into all the quarterly numbers. Let's see what they might hold. In this daily bar chart of ABT, below, we can see that prices made a nice run-up in September that included a gap to the upside. In October prices have retraced back to the rising 50-day moving average line. Prices are holding above the rising average line but in this weak overall market environment I would not be surprised to see prices close below the 50-day line. The 200-day moving average line is still bullish and intersects just below $63 at this time. The daily On-Balance-Volume (OBV) line shows a decline this month and signals a shift from aggressive buying to aggressive selling. The trend-following Moving Average Convergence Divergence (MACD) oscillator crossed to the downside earlier this month for a take profits sell signal. If the oscillator falls below the zero line it will be an outright sell signal. In this weekly bar chart of ABT, below, we have some "slippage" but no sell signals yet. Prices are well above the rising 40-week moving average line. The weekly OBV line shows a rise from late 2016 to this September so the recent dip may only be a "blip". The MACD oscillator on this longer time frame has begun to narrow towards a possible bearish crossover but that signal could take a few weeks. 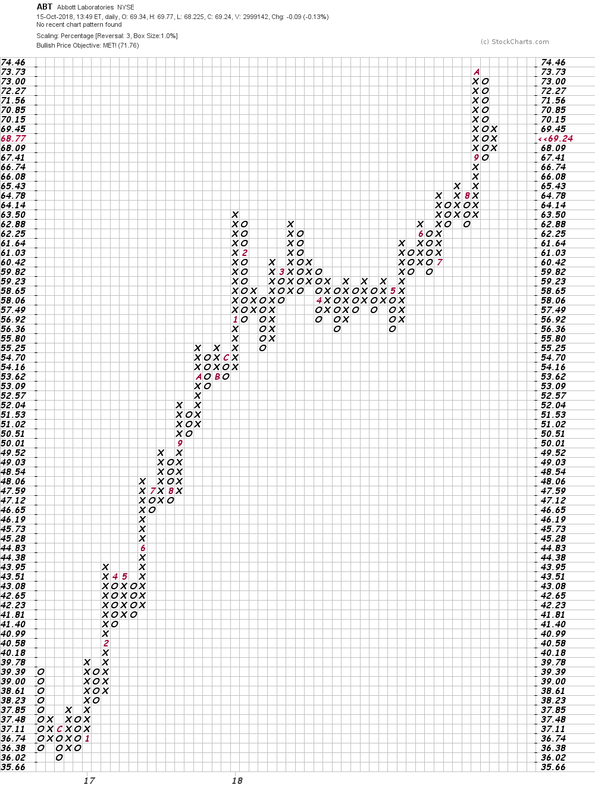 In this Point and Figure chart of ABT, below, we can see that prices reached an upside price target of near $72. The chart has not turned bearish but there is always a risk of a correction. Bottom line strategy: While the charts of ABT on not screaming sells, there are enough signals to suggest a cautious approach to earnings. I would sell down to a "sleeping position." Jim Cramer and the AAP team hold a position in Abbott Laboratories for their Action Alerts PLUS Charitable Trust Portfolio . Want to be alerted before Cramer buys or sells ABT? Learn more now.